Yesterday I mentioned the testimony of Philip Duffy to the U.S. House of Representatives Science, Space and Technology Committee, which included three seriously misleading statements. It is important to draw a distinction between Woods Hole Research Center and the Woods Hole Oceanographic Institution, both based in Massachusetts. The latter is a genuine scientific organisation, which specialises in ocean studies. 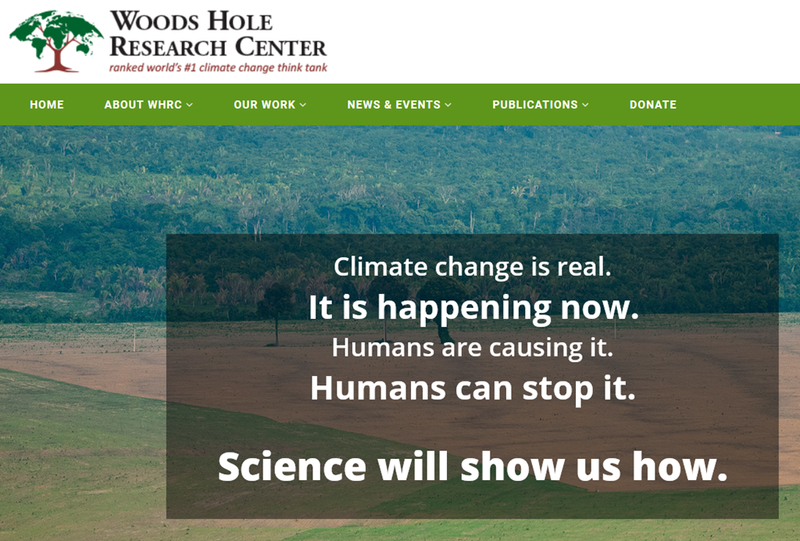 By contrast, Duffy’s Woods Hole Research Center is no more than a climate change think tank. Dr. Duffy is a physicist who has devoted his career to the use of science in addressing climate change. Prior to joining WHRC, Dr. Duffy served as a Senior Advisor in the White House National Science and Technology Council, and as a Senior Policy Analyst in the White House Office of Science and Technology Policy. In these roles he was involved in international climate negotiations, domestic and international climate policy, and coordination of US global change research. Before joining the White House, Dr. Duffy was Chief Scientist for Climate Central, an organization dedicated to increasing public understanding and awareness of climate change. Dr. Duffy has held senior research positions with the Lawrence Livermore National Laboratory, and visiting positions at the Carnegie Institution for Science and the Woods Institute for the Environment at Stanford University. He has a bachelor’s degree from Harvard and a Ph.D. in applied physics from Stanford. The idea that either Woods Hole Research Center or Duffy himself are objective scientific advisors is laughable. Thank you for clearing up this confusion Paul. 1) Whilst the debate in these US governmental sessions was clearly far from satisfactory from a sceptic perspective, as least the USA is engaging in formal discussions on this. What chance is there of this sort of public discussion, even of the basics of AGW, happening in the UK or even the EU? So, credit to the USA being so far ahead of us. 2) The nature of these proceedings highlights the crucial fact that the AGW industry is extremely well supported at governmental level and has real heavyweight, if deluded proponents, like Dr Duffy. If the sceptic community wants to take on the behemoths like Duffy, they are going to have to do a lot better than the likes of Lamar Smith and Mo Brooks, either by educating them much more comprehensively, or replacing them with professionals closer to the sceptic side of the AGW debate – professionals who will have data such as you present Paul, readily to hand in any debate to squash the fairy tales spouted by the likes of Duffy. This is deadly serious stuff and if the sceptics are going to turn the tide significantly, they need to up their game. Ian, don’t worry Lamar Smith has been well schooled by Sceptics. The only things “heavyweight” about Duffy is the sense of his own importance and his ability to lie with a straight face. That’s not a beard, its 5 oclock shadow. It’s not the beard that is the problem it is what you think about when stroking it. Commandeering a prominent and respected name to imbue an unrelated organisation with some of the status of the original. 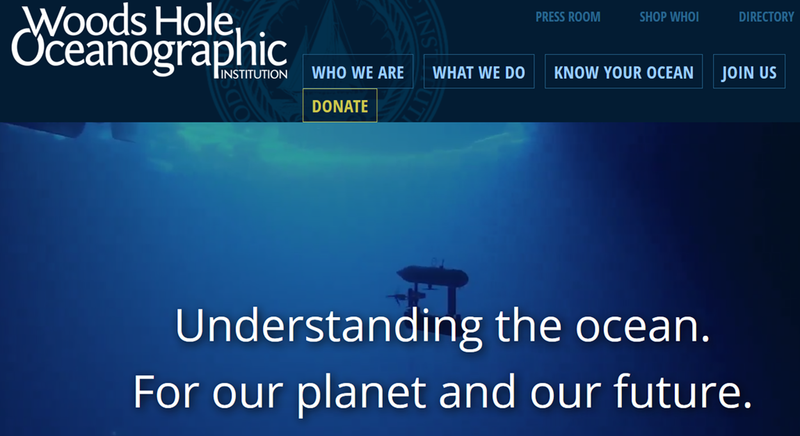 Close enough to WHOI and doubtless with strong enough connections to funders to make WHOI think twice about defending their “brand” – if they aren’t already “on board”. Certainly just a coincidence the names are sooooo similar. In the UK we have legislation regarding “Passing-off” which is making people believe that an organisation or product is from an established brand: surprised that the law-obsessed USofA has allowed this clear poaching of name / reputation. As stated earlier when this was brought up… The Research Center states that “Science will show us how”… but don’t expect an answer. They are hoping people will overlook that they are the ones “showing how” and manipulating “science” to give their preferred “results.” “Science” is the least of their concerns. I think the problem we have on our side is that while we can be certain we don’t face a CO2 armageddon and can rebut the warmist claims with data, when asked about the cause of our changing climate, we can’t be 100% certain as yet. However, the warmists are utterly convinced it is all our fault and that CO2 is to blame so come across better. I am sure someone told me that “only qualified climate scientists” were allowed to pronounce on these matters! Even trained meteorologists such as Dr Roy Spencer were beneath contempt. I guess it all depends on whose ox is being gored..
From a viewpoint of seventy eight years, I say, what changing climate that exceeds anything that I have previously experienced? I’m sure the people from Woods Hole Oceanographic Institute appreciate the prominent clarification. One of the most effective approaches might be to bone up on the climate changes of the past. I had always “learned” that things were gradual, but as with so many things, facts have injected themselves. At the end of the last ice age, temperature changes were rapid. When the vast glacial lake suddenly drained drained though the St. Lawrence into the Atlantic Ocean and polished off the conveyor belt known as the Gulf Stream with the huge and sudden influx of fresh water, we were immediately thrown back into an ice age for about 1000 years. Also, the effects of the sun-spot cycles causes warming/cooling. Then there is the earth’s orbit around the sun with lengthening/shortening of the elliptical path on a specific cycle, the changing tilt of the earth on a specific cycle and the earth’s “wobble”, also on a specific cycle. All of these put us either closer to or farther from the sun which effects the earth’s temperature. I think tying warming and cooling to the sun’s activities and position can be made understandable for most people. Oceanic cores and ice cores also provide good data for the past climates. Hit folks with the fact that all of the so-called “settled science” from the left comes from computer models which have yet to correctly evaluate reality. They are under the dictate of WHAT is put into the model. Tell them that the computer models are being used instead of actual data. Tell them that increasingly, on ground monitoring stations are purposefully being situated in places where localized heat sources are rendering their data unreliable and not reflective of actual conditions. Heathrow Airport is a shining example. Sadly, in the UK this would not get published in any mainstream press. We live with state censorship and a government of entirely non-scientists. But this is what you can know and be ready to tell folks. I tried to listen to his testimony, and couldn’t make it more than five minutes. Children should exit this site. It is strictly for grumpy old men with surprisingly good remnants of a proper education (ladies of any age can apply for honourary status).